(Bloomberg) -- A small cargo ship hijacked by some of the migrants it rescued in the Mediterranean Sea arrived in Malta’s main port after the island’s armed forces secured the vessel. 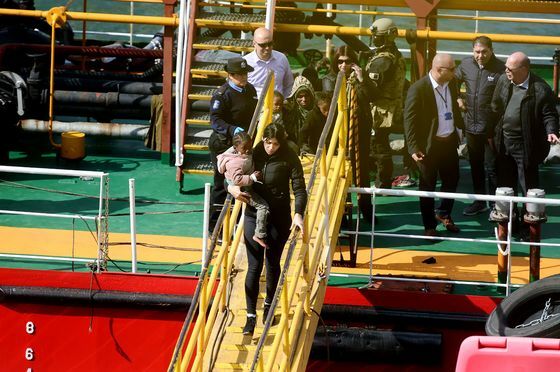 The special operations team -- backed by helicopters -- boarded the ship overnight and returned control to the captain, Malta’s government spokesman Kurt Farrugia said on Twitter. Bloomberg tracking data showed it docked in Valletta’s port on Thursday morning. The captain said that he and his crew were forced to direct the vessel to Malta. Associated Press said that the migrants feared they were being returned to Libya. The first migrant to disembark was a woman holding a baby, according to Italian news agency Ansa. Italian Deputy Premier Matteo Salvini, who has refused to allow migrant ships to dock in Italy’s ports, called the migrants "pirates." “They haven’t been shipwrecked,” said Salvini, who as leader of the anti-immigration League party has led a virulent anti-immigration campaign. “They’ll see Italy through a telescope,” he added.